At the Annual Board of Directors’ Meeting of Knox Church Crystal Falls Memorial Fund following the Labour Day service on September 3, 2006 at Historic Knox Church Crystal Falls , it was unanimously approved to establish, and fund on an annual basis, the “Canon Horace G. Baugh Crystal Falls Memorial Scholarship” to be awarded annually to a student entering his/her first year of university and who is descended from one of the families buried in Knox Church Crystal Falls Cemetery. Canon Baugh who passed away on July 22, 2007 lived in Morin Heights in the Laurentians was known throughout Quebec and devoted much of his life to the support of education and also served as a school commissioner for over 50 years. In 1951 he built the well known Church St. Francis of the Birds in St. Sauveur and was also instrumental in building Christ Church in Mille Iles, Quebec. Among his many duties he was for many years an airport Chaplain at both Dorval and Mirabel and he initiated the annual “Blessing of the Pets” on Mount Royal in Montreal. He has been inducted into the skiers Hall of Fame in the Laurentians. Canon Baugh was directly involved in preserving Knox Church Crystal Falls from destruction when a road was re-routed. He has played a pivotal role in the tradition of these annual services and performed the Labour Day service for over 25 years at this small historic Presbyterian church and cemetery. The Directors proposed the establishment of this scholarship in tribute to Canon Baugh’s invaluable contribution to preserving the church, his support of education and as a way of involving young people in the ongoing tasks of heritage preservation. The Knox Church Crystal Falls Memorial Fund is pleased to announce the first recipient of the Canon Horace G. Baugh Memorial Scholarship is Mr. James Buckingham. James is currently a student at Hautes Etudes Commerciale (HEC) in Montreal. He is the son of Gordon and Chantal Buckingham. James has been attending annual services at Knox Church since he was a young boy. The Board of Directors were pleased to make this first award of the scholarship ($500) at the annual service this year. 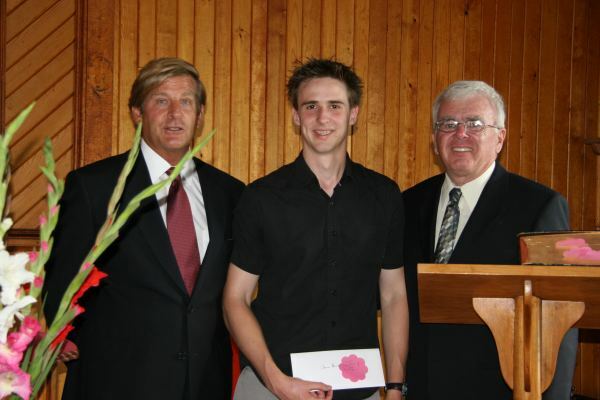 Seen in the picture above (left to right), Christopher C. Goodfellow (Chairman Knox Church Crystal Falls Memorial Fund), James Buckingham, Malcolm Bennett (Grandson of the builder of the church and son of Edmund Bennett who established the Fund). This church serves as a beacon to all who travel along Highway 327 between St. Jovite and Arundel following the valley of the Rouge River—one of the most picturesque stretches of highway in the province. Knox Church Crystal Falls Memorial Fund was started by Mr. Edmund Bennett in 1977. The objectives of the fund are to preserve the historic church structure and maintain the graveyard as well as to support other worthy endeavors. The Fund also underwrites the perpetual illumination of the structure. Canon Horace Baugh Perpetual Memorial Guestbook - Feel free to sign. We are listed at Canadian Culture!